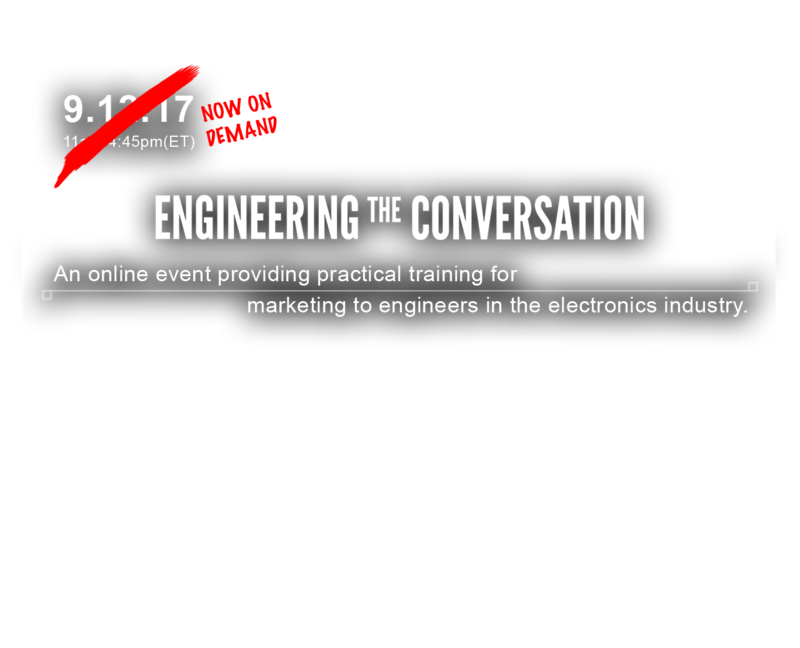 This FREE, on-demand event provides marketers and engineers with the right tools and techniques to successfully market to their ideal customers in the electronics industry. Engineering the Conversation, held live on September 12th, 2017, brought sales and marketing thought leaders together to share their experiences and expertise in digital marketing. Learn the fundamentals of marketing and advanced techniques from industry pundits ITEM Media, ON24, Hubspot, Conductor, Leadfeeder, Evidon and more. Register now to gain deeper insight on reaching your technical audience and discover how to turn a conversation into a customer. Give us your email, and we'll give you the latest updates related to Engineering the Conversation. Registration announcements, new speaker additions, and special offers - straight to your inbox. You're now in the know! Check your inbox for the latest news. Evidon launches its Universal Consent Platform – the first solution to help organizations comply with both the GDPR & ePrivacy Directive. The General Data Protection Regulation (GDPR) is a massive and complex privacy law that will affect companies worldwide. On May 25th, 2018, any company doing business in the EU is exposed to fines up to 4% of a company’s annual gross revenue or €20 Million Euro, whichever is more. Obtaining a person’s consent to use their personal data will prove to be the most difficult aspect of compliance. Add in the open questions about pending revisions to the ePrivacy Directive (Cookie Law) and companies are very confused. How to obtain that consent, however, is a question many companies are saving for the last minute. Without a practical, commercial-grade solution available, companies need to know where to go for help, now! Evidon has the answer. 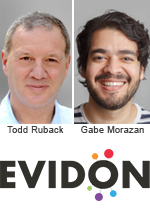 Join Evidon’s Chief Privacy Officer, Todd Ruback and Product Manager, Gabe Morazan, to learn how Evidon is bringing simple, scalable technology solutions to these complex compliance problems. As a technical industry marketer, you’re challenged to not only connect with your audience, but to do so while relaying highly complex information. Alongside your product or service, your Subject Matter Experts (SMEs) are one of the leading differentiators between you and your competitors, and, when used effectively, can help turn prospects into customers through thought leadership and trust. Are you overlooking or struggling with incorporating your SMEs into your marketing plan? ITEM Media is a triple threat in the media and marketing world – equal parts publisher, marketing services agency, and online event host. For over 40 years we’ve been bringing the latest in engineering solutions worldwide from our digital and print publications, Interference Technology, Electronics Cooling, and Environmental Test & Design, and through our online events, EMC Live and Thermal Live. We also offer a full list of managed marketing services to engineering companies. This presentation will cover overall trends in B2B e-commerce – projected to surpass $1.2 trillion by 2020 in the U.S. alone – and provide an inside look into how manufacturers and distributors of electronic components are engaging customers through e-commerce and social media. 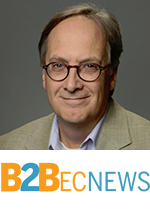 B2BecNews covers all the challenges and trends in the B2B e-commerce revolution. If you aren’t using website analytics to fuel sales growth you are missing out on real revenue. We’ll show you how marketing and sales teams can bridge the revenue divide using actionable sales intelligence. 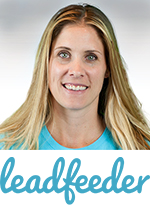 Christina Hall is the Head of Marketing at Leadfeeder. She has worked with SaaS, product and service teams for over 10+ years. She is a former HubSpot partner, and has been recognized by Clutch.co for marketing excellence. She lives in San Diego with her husband and 2 children. 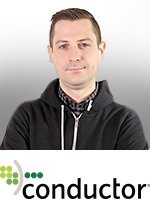 Leadfeeder provides actionable sales intelligence to sales & marketing teams around the world. Our technology helps companies identify anonymous website visitors so that they can convert promising visitors to sales leads. The days of having a sales plan that relies primarily on cold actions to generate leads – calls, emails, and visits – is long gone. Now, you need a multi-pronged sales approach that incorporates timely content that entices a prospect to come to you, and builds a relationship of trust. From content development to email nurturing and hosted events, the modern sales role is one of educate first, sell second. Has your sales team adapted to new sales demands and available sales channels? 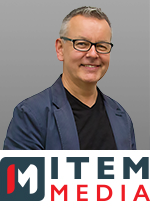 Graham Kilshaw, CEO of ITEM Media, reviews ways to modernize your sales approach and prepare it for the ever changing marketplace. Buyers today are on their own journey; they choose how and when they take in content and learn about your products or solutions. In the digital age, webinars have become the leading way that companies both generate leads and nurture them towards making a purchase. Webinars are the best tool we have to engage prospects and turn them into customers. This is your chance to learn how. 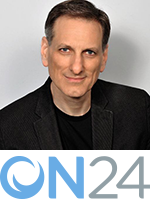 ON24 is the global leader in webinar-based marketing solutions that drive demand generation and customer engagement. Its patented cloud-based platform features an interactive and immersive user interface and industry-leading webinar analytics for events, campaigns and benchmarking. Providing one-click access from any computer or mobile device, ON24’s award-winning solutions are integrated with leading CRM and marketing automation platforms, enabling marketers to optimize demand generation, enhance lead qualification and accelerate opportunities in their sales pipelines. In this talk-lesson Jordan Skole, product marketing specialist at ActiveCampaign will walk you through how to motivate internal stakeholders using marketing automation tools, Arduinos, and micro service APIs. To keep things lean, we will be deploying our API using Serverless, AWS Lambda and AWS API Gateway. 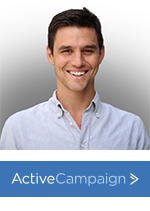 ActiveCampaign provides market leading marketing automation, email marketing and CRM solutions for small businesses. While we provide a level of sophistication suited for enterprise level businesses; the ease of use of our platform, accessible pricing and support focused on customer success make ActiveCampaign and ideal choice for small businesses. This talk will walk through how I went from an academic understanding of the 4 P’s of marketing to running a demand generation campaign for decision makers in a market that was new the company and foreign to me. 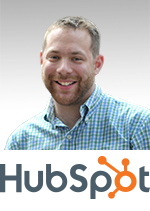 Zack Wolfson started his professional career as a marketer using the HubSpot tool set. After that company got acquired, Zack left to join HubSpot in the Sales Engineering department. Now after 3 and a half years, Zack is the manager of the North American Sales Engineering team, helping our sales team close deals by providing technical expertise and product knowledge. Many consider trying to reach out and connect with engineers and technical professionals similar to those dreams where you can’t be seen or heard no matter how loudly you scream. Fortunately, there is a powerful tool available to any marketer, technical content. Unfortunately, many aspects of generating and leveraging technical content can be compared to shamanistic rituals or are techniques supported by data as accurate as political poles. In “Connecting with Technical Content” I hope to provide some basic and experiential insights and observations in potentially useful ways to think about, generate, and follow through with effective technical content. JJ Delisle attended the Rochester Institute of Technology, where he graduated with a BS and MS degree in Electrical Engineering. While studying, JJ pursued RF/microwave research, wrote for the university magazine, and was a member of the first improvisational comedy troupe @ RIT. Before completing his degree, JJ contracted as an IC layout and automated test design engineer for Synaptics Inc. After 6 years of original research–developing and characterizing intra-coaxial antennas and wireless sensor technology–JJ left RIT with several submitted technical papers and a U.S. patent. Further pursuing his career, JJ moved with his wife, Aalyia, to New York City. Here, he took on work as the Technical Engineering Editor for Microwaves & RF magazine. At the magazine, JJ learned how to merge his skills and passion for RF engineering and technical writing. 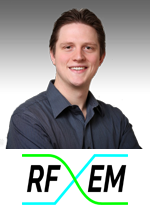 In the next phase of JJ’s career, he moved on to start his company, RFEMX, seeing a significant need in the industry for technically competent writers and objective industry experts. Many other opportunities have followed, as JJ continues to advance his business and skills in both technical applications and communication. It is very typical that engineering and IT are the last folks to learn about changes needed to execute search campaigns, therefore creating an unnecessary friction between the group and others. In this session we will discuss how to avoid these pitfalls by learning the proper times to bring engineers in on search projects to ensure realistic deadlines and internal harmony using real world examples and best practices. Conductor is a technology company driven by a deep passion for helping marketers. With our software, marketers make smarter decisions every day, from naming their products to creating great content. We provide businesses with intelligence about how their customers search. Kenneth will describe tips on how he uses LinkedIn to network and help drive business. He’ll describe how to establish brand recognition by providing real customer value through networking, publishing, blogging and participation in LinkedIn forums. 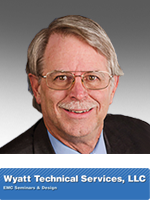 Kenneth Wyatt is president and principal consultant of Wyatt Technical Services LLC, as well as the senior technical editor for Interference Technology Magazine. He has worked in the field of EMC engineering for over 30 years with a specialty is EMI troubleshooting and pre-compliance testing. He is a co-author of the popular EMC Pocket Guide and RFI Radio Frequency Interference Pocket Guide. He also coauthored the book with Patrick André, EMI Troubleshooting Cookbook for Product Designers, with forward by Henry Ott. 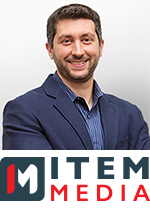 He is widely published and authored The EMC Blog hosted by EDN.com for nearly three years. Kenneth is a senior member of the IEEE and a long time member of the EMC Society. He may be contacted at ken@emc-seminars.com orkwyatt@interferencetechnology.com. Join our mailing list to receive the latest updates from Engineering the Conversation.